Home › Philosophy › A Philosophy Behind Technological Development. I have a lot of technical designs I hope to apply to the real world, even if they only suit me personally because they are either too impractical or simply undesirable for most. Anyone who has read any of my posts before knows I’m fascinated by vapor compression systems and their application in improving the technological state of existing functions in the household. I’ve made it abundantly clear, I think, that certain construction materials should be avoided without exception due to their toxicity, un-sustainability and limit lifespan. This adds an additional challenge to redesign machines engineered in an oil driven society where we are surrounded by cheap synthetics that although they poison our environment, have an abundance of practical uses. (I’m not against plastic per se, just dumb plastic). I’ve found that once I started eliminating certain substances from for instance, a refrigerator, I found there wasn’t much of it left. In order to engineer a refrigerator using materials that can be infinitely recycled and not downcycled, I have to start from scratch or at least go back 80 years or so before plastic was common and planned obsolescence adulterated refrigerators into disposable junk. Please note; I will from time to time link to Wikipedia articles. I am in no way advocating Wikipedia as a reputable source of information to be relied upon. It does however contain a great deal of information which is a good starting point if one wants to investigate a subject and find related concepts to it. A complete redesign is a lot of fun and actually seems easier than attempting to overcome the limitations of existing technology. There is a general philosophy behind all of this that I haven’t been able to coin a befitting name as of yet. 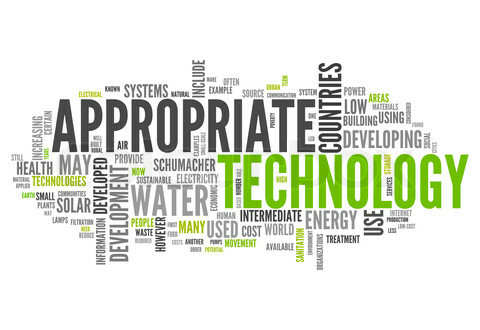 I often speak of “Appropriate Technology” in describing my attitude about the project, and that term alone says quite a bit about my attitude and by most people’s definition puts serious social, environmental, and moral requirements on the ultimate design outcome. I gather that the term has been around for about 40 years or so, but the idea goes much further back. Many projects defined as AT are small scale, labor intensive or rely on renewable energy resources and more often than not have been aimed at the global south. This is not always the case though applications of AT are being found in people’s lives in industrialized nations where the public, from time to time, is reminded of the environmental costs and long term economic cost of short term solutions and instead opts for technology that is specifically designed for the local climate, resources available, social needs, etc.. One example being the design of a domicile specific to the climate in which it is to be built as opposed to the cookie cutter development homes that take no consideration to the seasons, sun, temperature, precipitation, etc.. It is my belief that the term AT can be applied to technologies that are very complex (no more than they need be), and relieve the citizens of Earth from monotonous and laborious tasks while maintaining a philosophy of not only preserving the future of Earth as we know it, but improving the standard of living for everyone. This model, of course, does not fit with the capitalist economic system, so something must be done of that. I certainly advocate the advancement of AT that serves the needs of everyone. In order to really be qualified as AT, a technology really should, but nothing is perfect. This is the incentivising goal of AT as a general philosophy in engineering design to always construct with future improvements in mind; always strengthening, never cheapening. There was a time when most products were built to be long lasting, durable and repairable. That was a much different time and those ideals do not apply to very many things, save guns and other weapons. Physical technologies should be durable and repairable, but perhaps making things that last forever isn’t always ideal. An appliance should be efficient, practical and it should be made in something of a modular fashion such that technological improvements can be integrated in, or the appliance can be fashioned to serve another purpose. These are all difficult challenges that are practically impossible to satisfy resulting in eternally evolving technological progress where the whole of human civilization steps in line with the natural laws of the universe. This brings us to “Cradle to Cradle“. This is basically a metabolic view of technological design and the role of industry where the components of a technology are viewed as technical nutrients and are recycled in a never ending loop of remanufacture and improvement, much like the biological world. When a piece of hardware is no longer useful or can’t be further upgraded, it’s component parts can be fed back into the metabolic process without waste and downcycling. This is a goal, maybe not practically possible, but a goal nonetheless. How we organize the production and distribution of these technologies is vitally important; a topic I hope to touch on soon.